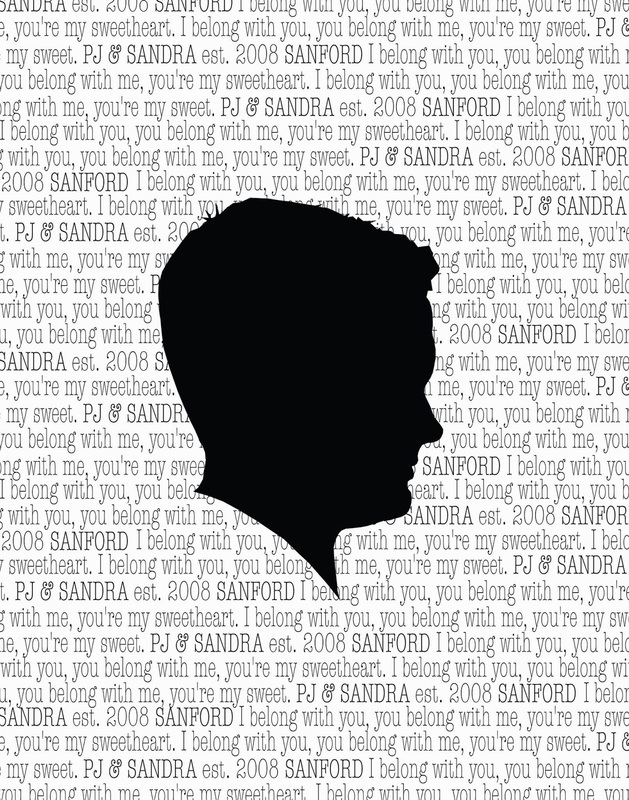 I made these silhouettes for my my anniversary with my husband like 4 years ago... but I never got around to getting them printed and hung up. Well this year was the year. 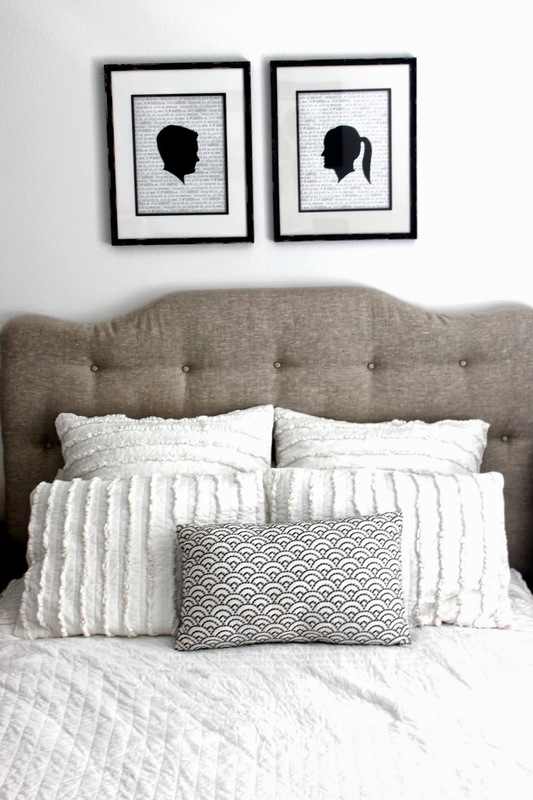 I surprised my lover, PJ, with them and hung them up above our bed. I'm quite happy with how they turned out! I wrote the lyrics to the song Ho Hey in the background ... you know... "I belong with you, you belong with me your my sweetheart" along with our names and the year we got married. I wanted to get gold frames but couldn't find any I liked....so I went with black. I figured I could always spray paint them when I get both sick of these and antsy to paint something. 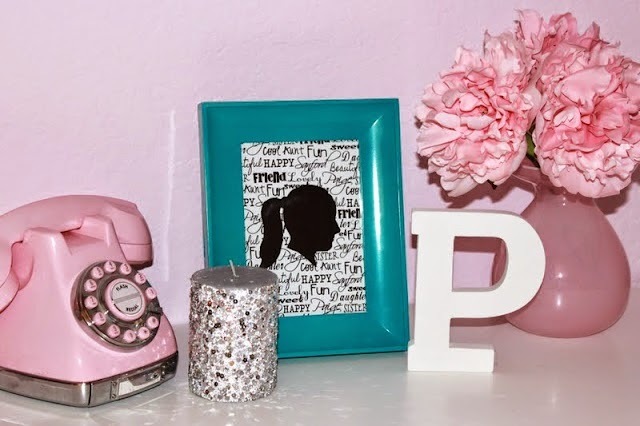 This is such a thoughtful and great gift idea for someone you love. One time I made one for my sister in law for her birthday with words that described how amazing she is in the background. If you are interested in getting one made you can go to my shop. But I will also be posting a Photoshop tutorial next so keep your eyes peeled! 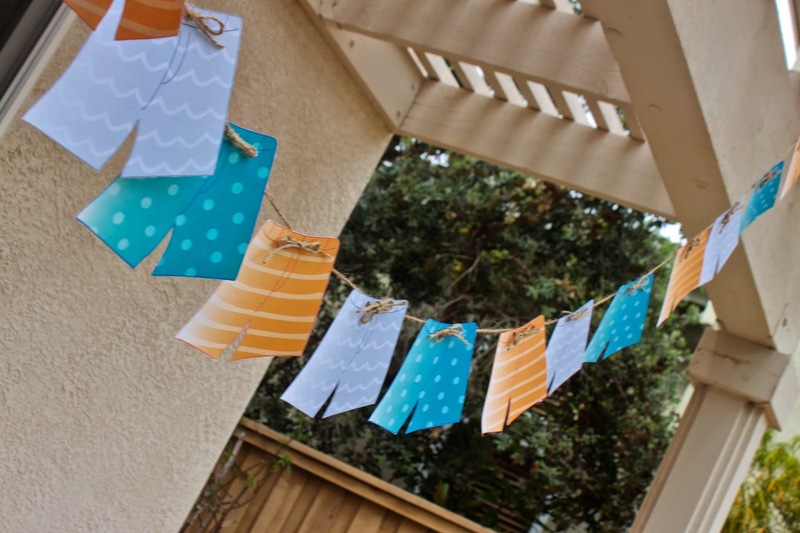 For the Surf's Up baby shower, I made this board shorts banner and thought it was the perfect way to expand on the beach theme and incorporate some "boy" into the decorations. Here it is in action. I wish I had gotten a better picture of it! But I made this mini version of it just for this tutorial. Just click on the picture below to download the banner. 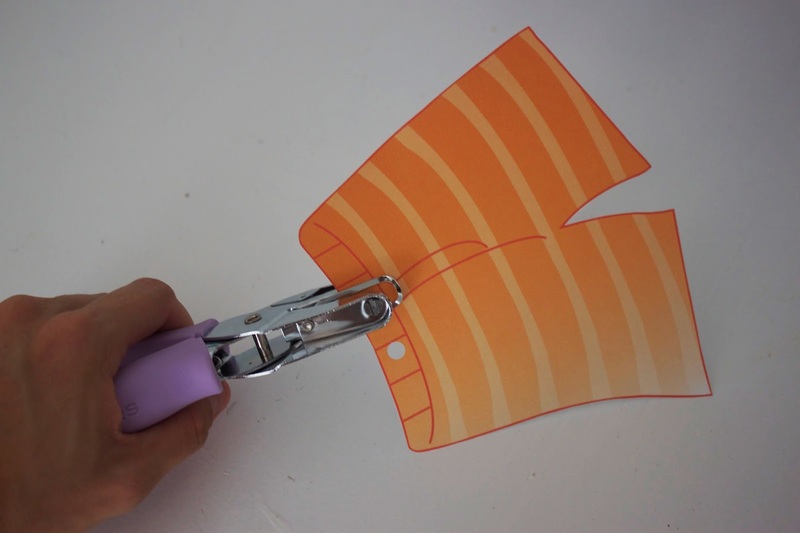 Print and cut out the shorts...as many as you need for as long as you want to make it. 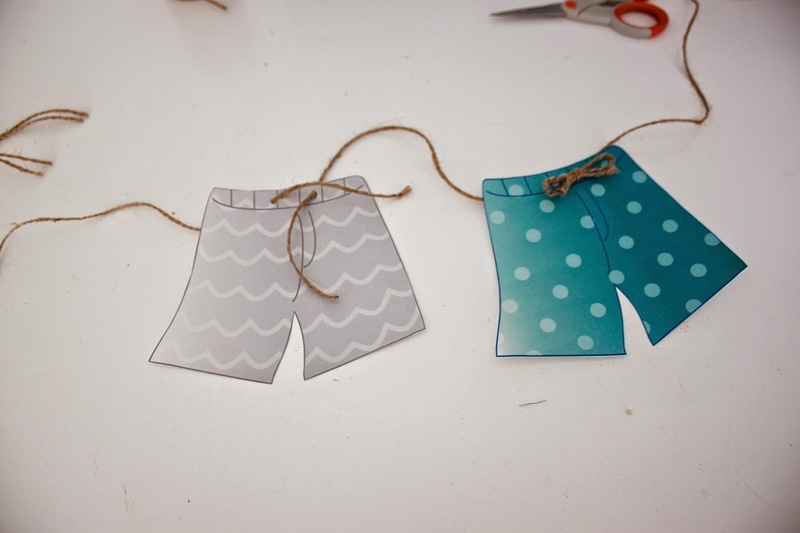 My idea was to tie these together so that they look like they have drawstring ties, like most board shorts have. Punch two holes in the top middle about 1/2 an inch apart. I used twine to tie these together, but you can use any kind of ribbon etc. 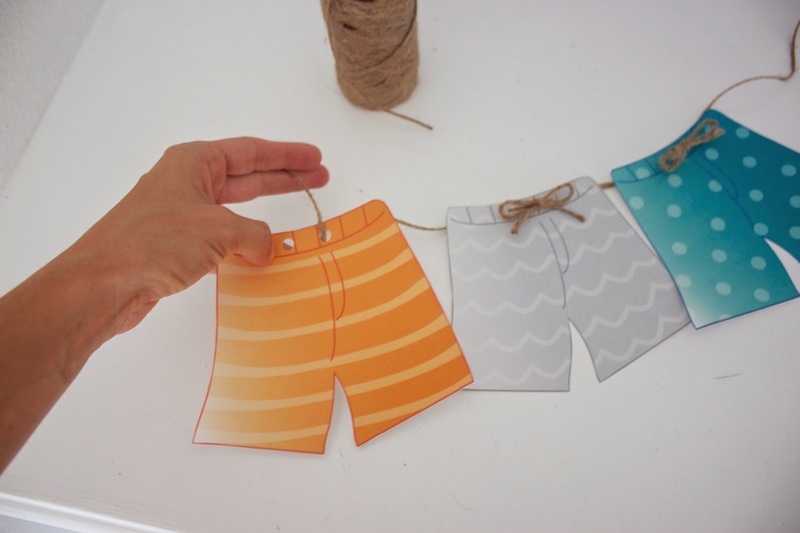 Cut 1 piece of twine for each pair of shorts you have. I cut mine about 8 inches so that they would be pretty close together. To start off you will need 2 pieces of the twine you cut out. Put 1 piece through a hole, from the back through to the front, then another piece of twine through the other hole and then tie together like you would tie your shoe to get a little bow. You may have to trim the ends a little to get the bow length right. 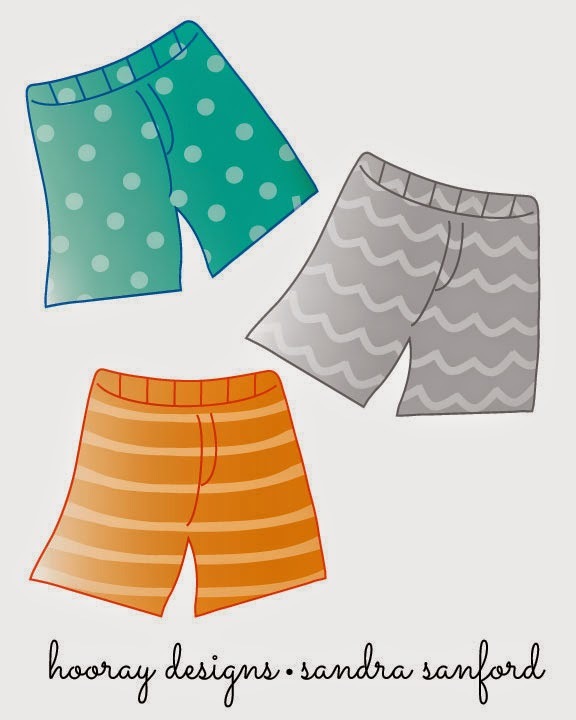 Then take a the twine from that pair of shorts and put it through the hole of the next pair of shorts. Grab another string and put through the second hole, tie together, and so on until your banner is the length you desire. 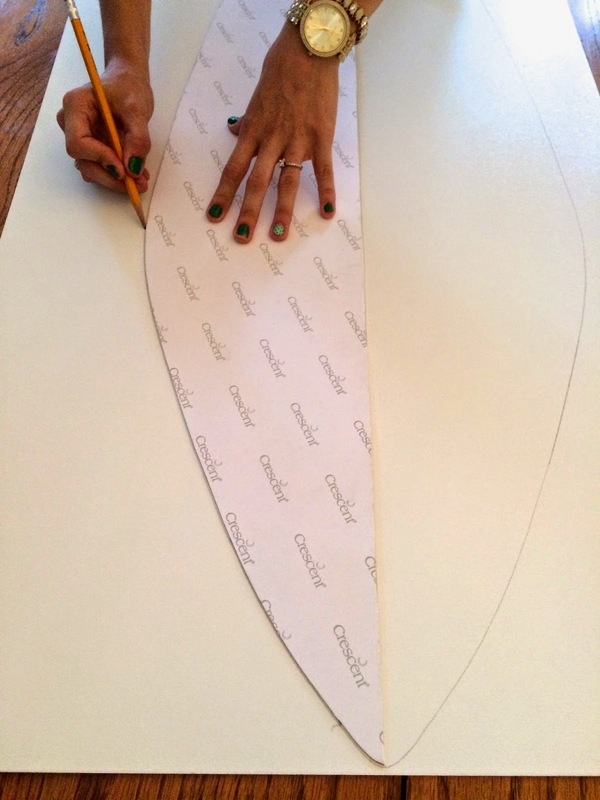 Then for the ends of the banner, tie an extra long piece to tie your last bow on each side. 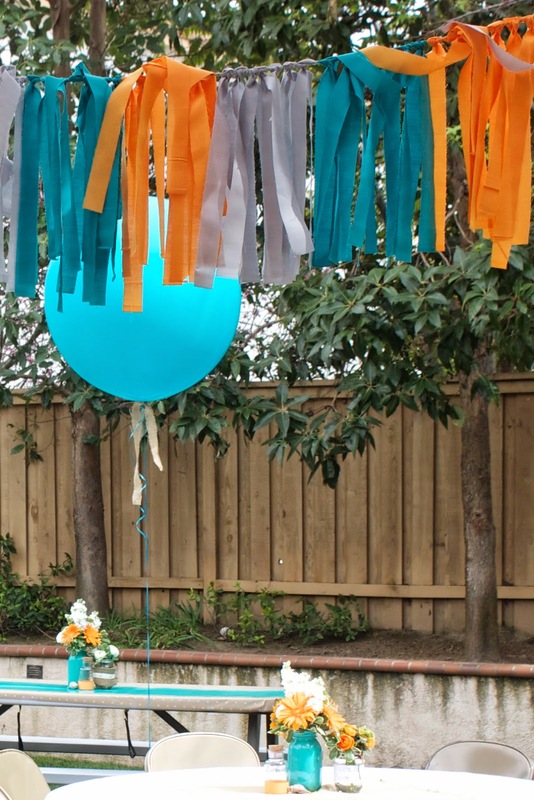 You want the end pieces of twine to be longer so that you can use them to hang up the banner. 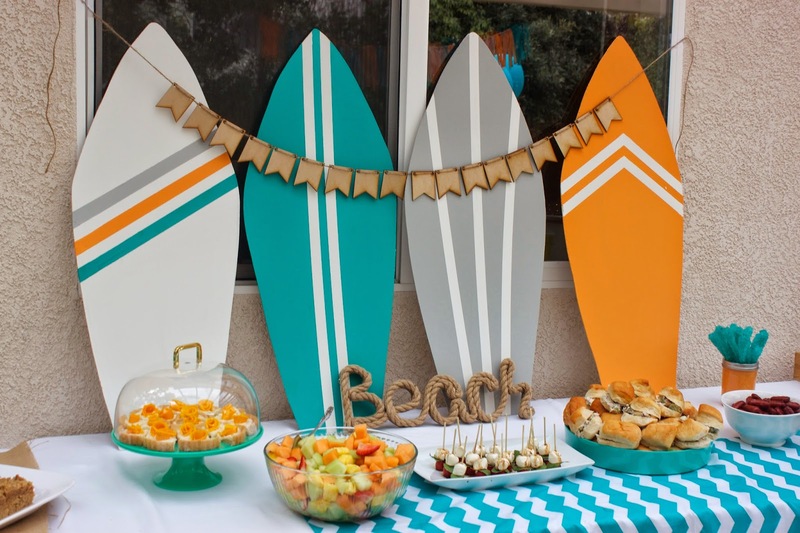 Making these surf board props was so easy and so fun! The best part is you can pretty much make any shape you want. Or make them as big or small as you want. 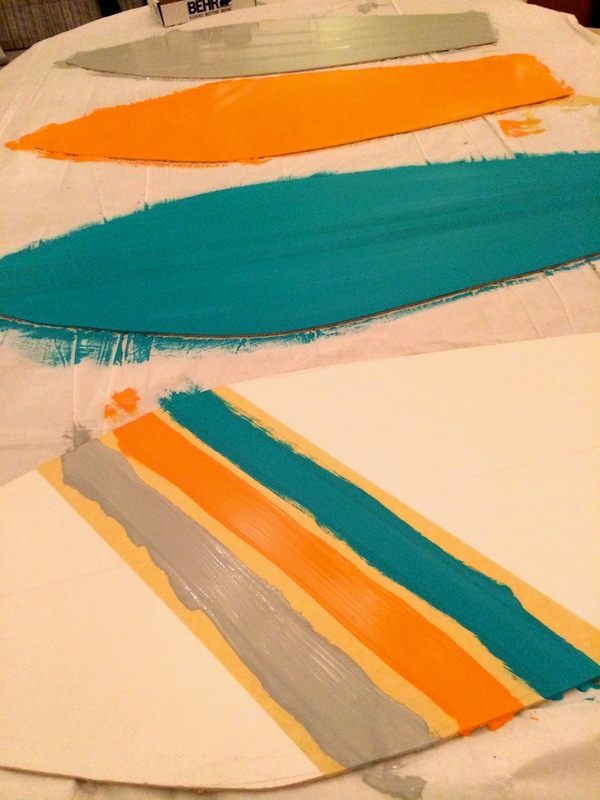 Paint samples in the colors you want to use. First we went to Home Depot and picked up a big sheet of wood. We found an inexpensive one that was already painted white so I figured I'd save myself a step and go with it. (You could otherwise get regular wood and paint it with white primer later on when it's painting time!) We had them cut it down for us into 4 equal pieces. We got a poster board and just sketched out a a surfboard shape of 1 side of the surfboard. It's hard to sketch out each side exactly the same. So if you just make the stencil of one side of the surf board and use it to trace both sides of the surf board onto the wood it will come out even. You are going to paint over it so it's not a big deal to have pencil marks and sketching on your boards. Trace 4 surf boards on the wood in this manner and they should all turn out exactly the same. Then you take the good ol' jig saw and cut them all out. Try your best to follow the line you drew! My sister-in-law is a wiz with a jig-saw. Thaks for your help Lisa! 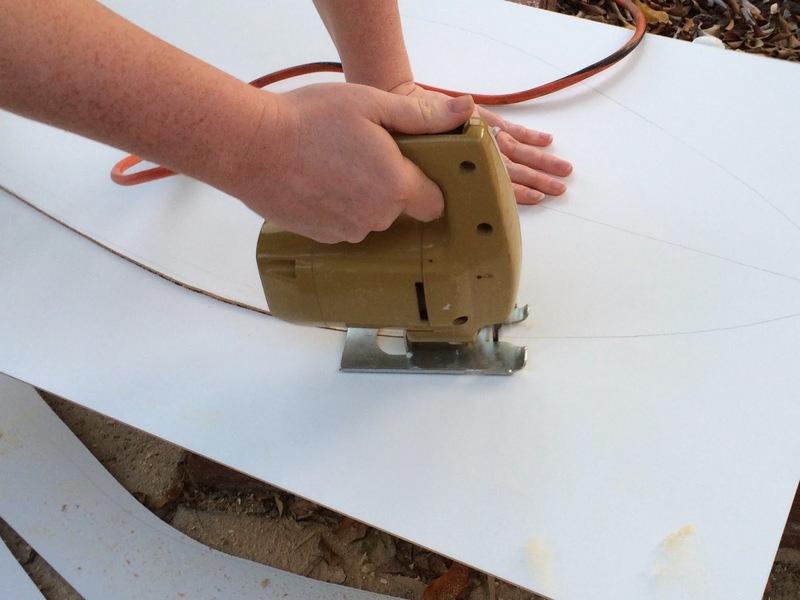 Then tape the pattern you want to make on your boards. I just went with some simple stripes. This is the part where you can get a little creative! Paint away! If you didn't get pre-painted wood. You would need to paint it with white primer first and let it dry. Then tape it up and paint it. Remove the tape and let dry! And you are done! The orange surf board got a little nicked. This wouldn't have happened if I hadn't skipped the primer step. So if you want them to last longer, I would go with painting them with primer first! But I just took some of my extra paint and touched it up and it was no biggie! 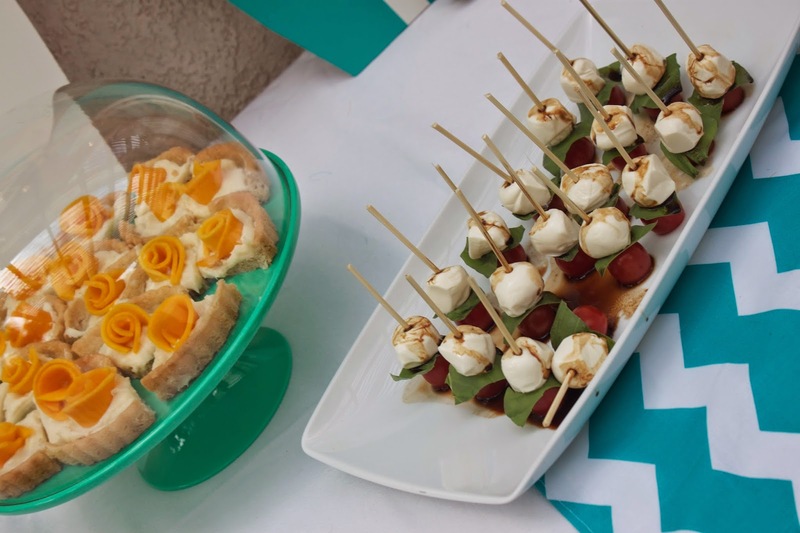 To see more pictures of the party where these babies were on display go here! 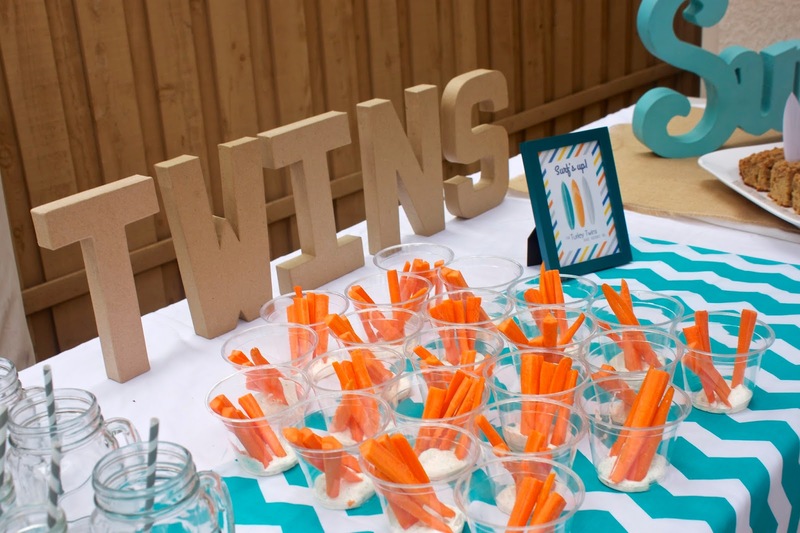 Back in March my friend Meg & I threw our friend Carli a Baby Shower for her twin boys. She has the cutest 3 year old girl and we were excited for her to add 2 boys into the equation! 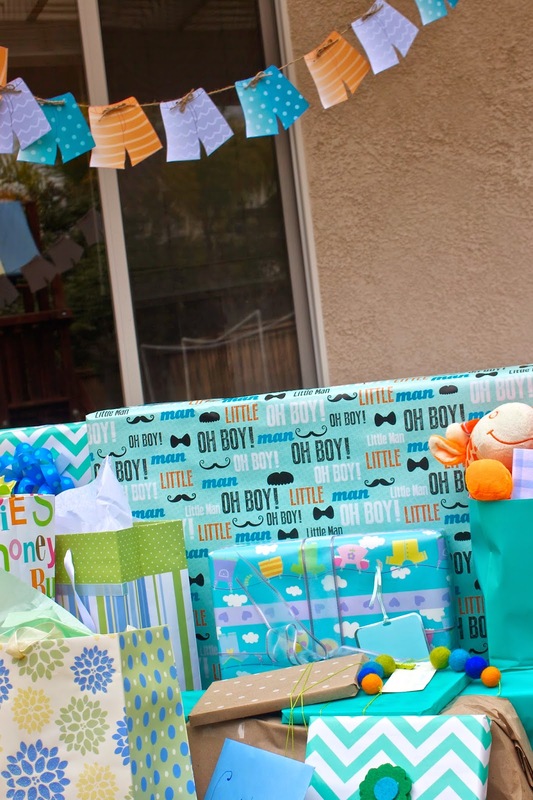 The soon to be fam of 5 needed double the boy stuff asap! She and her little family love the beach and daddy loves to surf... so we took that and ran with a surf's up beach theme. I'll be posting a tutorial for these surf board props soon! I focused on the decorations... while Meg was in charge of the food. She made some yummy grub! 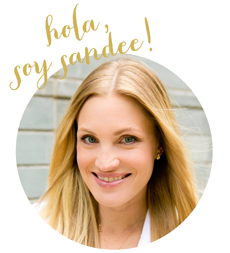 Check out her blog for recipes! 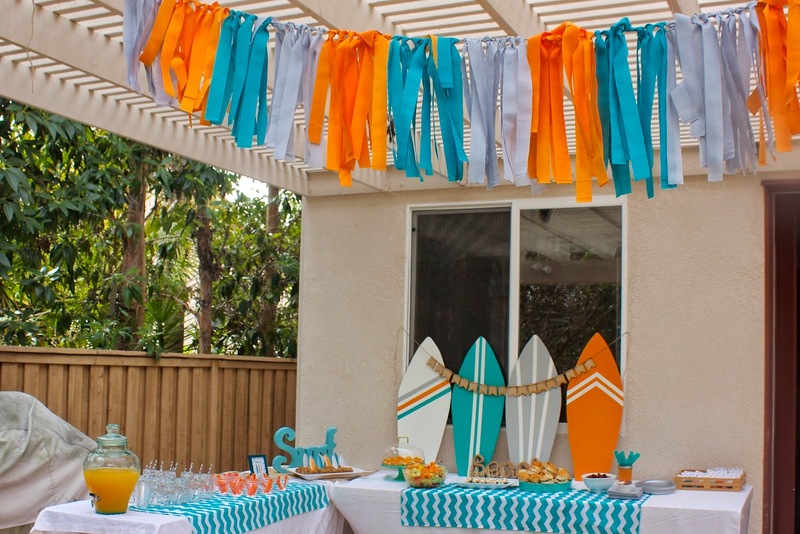 The "sand bars" were my favorite...especially with the surf board toppers! But those mango tarts were dang good! 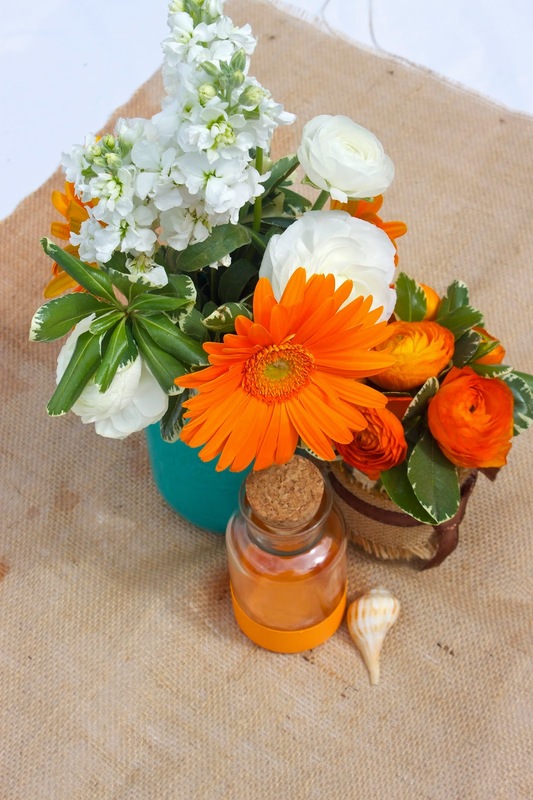 Our Friend Laree Poole did the flowers and she is amazing! The twins are going on two months old now... and seriously cute! Welcome to the world Mason & Mackay! 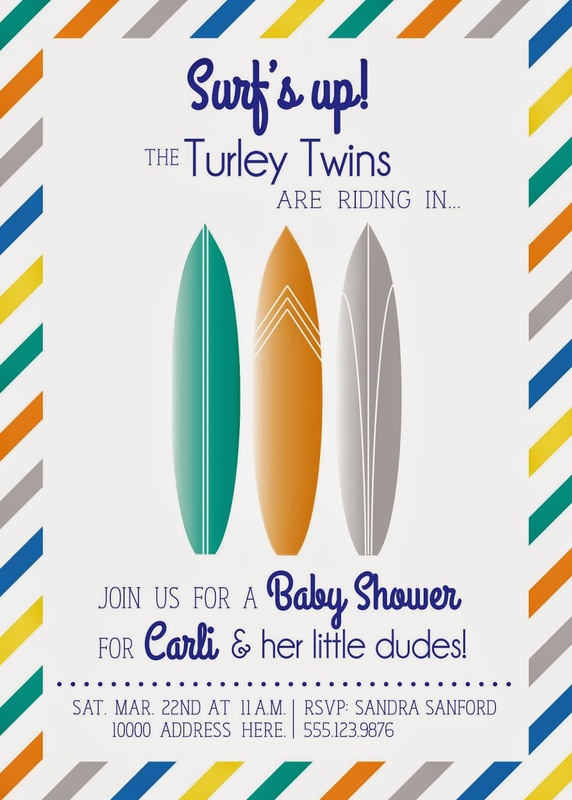 & Congrats to the Turley Family! Hooray Is Here To Stay! There are so many ideas and so much creative energy just stewing and churning in my brain. I need an outlet ASAP! What better way to get it all out then to start a blog right?!!! The premise of this blog is creativity and was inspired by a talk called "Happiness, Your Heritage" by President Dieter F. Uchtdorf (a leader of the LDS Church). In it he says that we are made to create and can be creative in all aspects of life. I love this and know being creative bring joy to my life ...whether it's painting something, playing chalk with my kids, or simply making dinner for my family. "The desire to create is one of the deepest yearnings of the human soul. No matter our talents, education, backgrounds, or abilities, we each have an inherent wish to create something that did not exist before. If you are a mother, you participate with God in His work of creation—not only by providing physical bodies for your children but also by teaching and nurturing them. The bounds of creativity extend far beyond the limits of a canvas or a sheet of paper and do not require a brush, a pen, or the keys of a piano. Creation means bringing into existence something that did not exist before—colorful gardens, harmonious homes, family memories, flowing laughter." 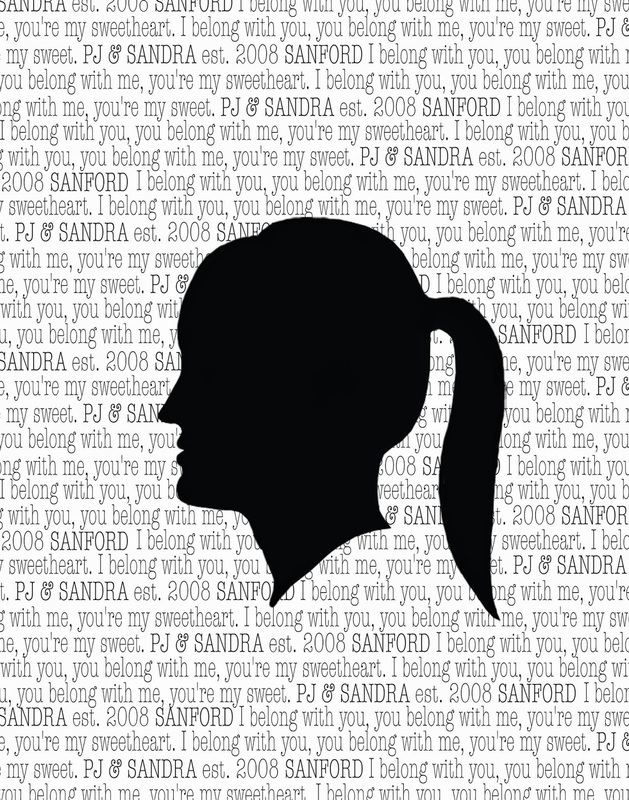 Click on the picture to download this printable I made just for you! My favorite way to be creative is to make things that celebrate those around me. So the name Hooray seemed fitting. This little venture will be quite the learning process for me, but that is exactly what I'm going for! The chance to use my creative side, challenge myself and grow in the process. And if I can inspire others in some way too, then that's just a plus! So keep an eye out for Hooray!! !